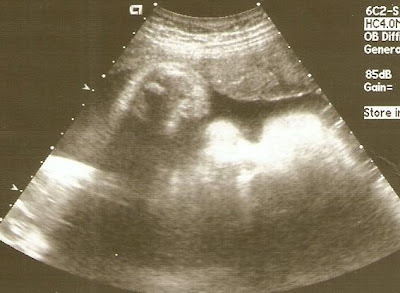 Monday was another fetal assessment. Unfortunately my husband was unable to come to this one due to some stuff at work, but my parents happened to be in Winnipeg that day and they were able to join me instead, which was very special for me and for them! We got to see the baby open and close her eyes again, and this time we even got to see a little bit of hair on her head! So cute! She rated very well on everything except her size. As you may recall, 6 weeks ago she was at the 40th percentile, 4 weeks ago she was 60th, 2 weeks ago she was still 60th, but this week she had jumped to 90th! She's 7 lbs already and suddenly growing very fast! This is quite common in babies of diabetic mothers with poor control of their bloodsugars, but since my control is really very good, this was a bit surprising. 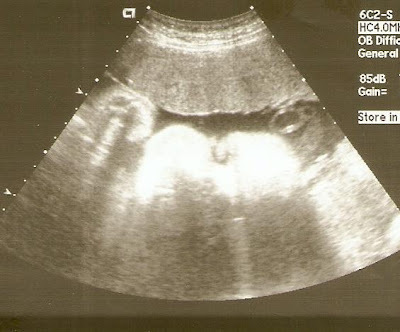 So we left it as a bit of a wait-and-see...see what my OB says, and see how much more she's grown by next week. (More on that later.) It's good to know, though, that she is otherwise VERY healthy and looking great! Monday night our doula came over for a meeting and also brought her back-up doula. (Since our doula has 3 small children, she may not be able to be at the hospital for the whole time I need her, in which case she will call on her back-up.) We talked about the change in plans (i.e. to a c-section), and how she will be involved under the new circumstances. Tuesday's first appointment was my counsellor from the Youville Diabetes Centre. She gave me a recording of her reading a relaxation exercise (hypnotherapy) to help me relax for my c-section. (As some of you know, I'm a bit nervous about the idea of surgery.) I've listened to it a number of times already and it's really great! I just need to get it embedded in my brain before the c-section so that I can get into that relaxed state without the recording by then. We had intended to go to the hospital's labour & delivery information session Thursday night as well (they hold these once a month), but opted out of that one. We had so many of our questions answered at the pre-op appointment, that we just felt it wasn't necessary and that we'd rather spend the evening at home relaxing. Yesterday was my obstetrician appointment. A couple of things came out of this. First, my blood pressure is still too high and going up. (After this busy busy week, I'm not surprised!) So he gave me a prescription for baby-safe blood pressure meds. I had hoped to avoid those, but clearly it has become necessary. As an added incentive, I actually had another spot in my eye yesterday, likely indicating another small bleed in my retina. (This is not terribly surprising as the leaky blood vessels take a while after pan-retinal laser treatments to shrivel up.) I'm not overly surprised or concerned at this point, because I'm confident that the laser treatments I had in the last couple of weeks will deal with this in time, but it does make me quite anxious to get my blood pressure down. (As a side note, I think the spot is gone today, which hopefully indicates that the blood cleared up.) I started the pills today, so hopefully they make a difference. Second, and more significantly, my doctor is tentatively planning on taking the baby out earlier than anticipated. He is concerned about the fast growth at this stage, as this type of growth in babies of diabetic mothers can sometimes lead to sudden unexplained intrauterine death. Not something we want to risk. He didn't seem worried that she was in imminent danger, but we definitely want to weigh the various risks and take her out as soon as doing so is less risky than leaving her in. What this means is that I will likely have an amniocentesis (i.e. a big long needle stuck into my belly to extract a sample of amniotic fluid) at my fetal assessment next Tuesday (the 19th) to determine if Bud's lungs are sufficiently developed. If they are, she comes out. If they aren't, we wait a few days and then she comes out. (I'm not sure if I'd need another amniocentesis first or not.) I will see my obstetrician either on Tuesday after the F.A./amnio or on Thursday and he will make the decision then. So, in theory I could be having my c-section as early as next Wednesday, but it sounds more likely that it would be Friday or later. By next Friday she'll be 36 weeks, at which point taking her out is very safe (as long as her lungs are okay), but she will likely need to stay in the NICU (Neo-Natal Intensive Care Unit) until she's full-term (i.e. 37 weeks), so we may end up coming home without her for a few days (well, nights - our days will be spent in the NICU with her). Obviously that's not what we had wanted, but obviously we want to do what is best (and safest) for her, so we will roll with the punches! It will probably make for some new challenges with bonding and breastfeeding, but at the end of the day we will be able to bring home a healthy baby girl - and THAT's what's important. :) If her lungs are fully developed, she will not be considered "premature", just "pre-term", and we are told that pre-term babies at this stage are just fine in terms of health and development, so it shouldn't have any lasting effects on her. She'll just need a bit more help and observation at the outset.So...that's that. Now we wait and see what happens on Tuesday at the Fetal Assessment and the amniocentesis. My husband and I have become very aware this week how lucky we are to have all of the fantastic medical support that we do. The appointments are definitely frequent and tiring, but we are so happy with the wonderful team of health professionals we have behind us. This includes our soon-to-be pediatrician, with whom I've already been in contact with, and with whom I'm already VERY impressed! We've often heard "Oh he/she is the best in the city!" about various of our doctors too, which makes us feel EVEN better! The three of us are in very good hands! 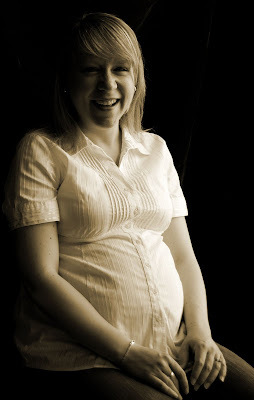 In spite of these factors that are making a diabetic pregnancy a little complicated, we do feel very very lucky. In other news, I have been exhausted this week, but I guess that's not surprising given all those appointments! Also, I haven't been sleeping as well as my belly is just getting so heavy and I've been having a lot of Braxton-Hicks contractions at night which aren't painful but aren't really comfortable either. Plus, now that the baby is so big, anytime she moves around in there I REALLY feel it! (And she still moves around a lot!) On a kind of cute note, she seems to really like her daddy's voice. When he talks to her close-up, she moves around in response to his voice! 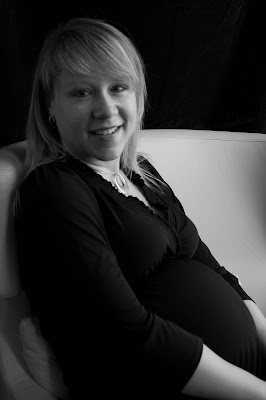 Now, a couple of pictures from the fetal assessment, and a few more pictures from the photo shoot with my very talented friend! Wow, good luck next week! Looking forward to reading your next posts--it's like following a soap opera on TV! lol - thanks Lyrehca. I don't know if that's a good thing or a bad thing. ;) I'll keep you posted. Sorry I haven't been able to answer your book interview questions - as you can see, things have been a bit crazy over here.